I had an interesting group tutorial to a large group of level 2 hair students, they are on a study programme with us at Taunton Campus in Bridgwater and Taunton College, in Somerset, United Kingdom. Students worked in small groups first discussing what "sustainability" meant to them and also how this may impact on the careers and the industry they are working towards working in. 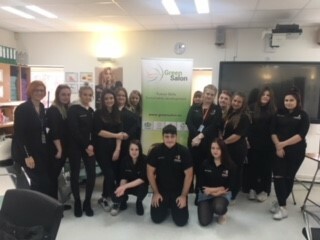 The students were able to carry out further research on this topic, and are very interested in the green salon Project and the partner's involvement and the outcome of this.